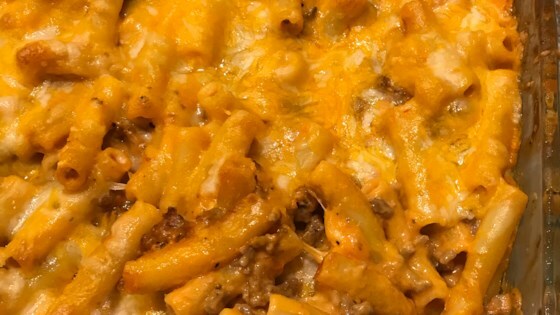 "Baked ziti without the ricotta cheese. I made this one night out of what I had available, and the family thought it was fantastic!" Fill a large pot with lightly salted water and bring to a boil. Stir in the ziti, and return to a boil. Cook the pasta uncovered, stirring occasionally, until the pasta has cooked through but is still slightly firm, about 12 minutes. Drain well. While the pasta is cooking, heat a large skillet over medium-high heat and stir in the sausage. Cook and stir until the sausage is crumbly, evenly browned, and no longer pink. Drain and discard any excess grease. Stir in the pasta, spaghetti sauce, and Alfredo sauce. Transfer the mixture into a large baking dish, and top with the Italian cheese blend. Bake in the preheated oven until the sauce is bubbly and the cheese is melted, about 15 minutes. A triumph for lazy people everywhere! Great recipe! Cheat, quick and delicious! I only had ground beef on hand and it was still amazing. Easy and Delicious. I added sliced turkey pepperoni (half a bag) to the mix and it added a nice texture as well as flavor to it. Loved this! My family enjoyed this recipe. The addition of the Alfredo sauce really gave it a different creamier taste and texture than my usual Baked Ziti. I will make it again.